Win a copy of Retrofitting Suburbia! We’re celebrating — Enter our draw for a copy of Ellen Dunham-Jones’ and June Williamson’s Retrofitting Suburbia! All we ask for is a few clicks and an undying passion for urbanism. Scroll down to see who won! Over the next 3 weeks we’ll be celebrating the launch of our masters program and our new blog with a series of fun contest/giveaways. Our program has a lot to offer, but we’re new on the scene and need to get the word out so potential students can find us. So, this initiative is as much a way of spreading news about our program (with your help!) as it is about engaging urban enthusiasts in a fun and constructive conversation about the built environment. 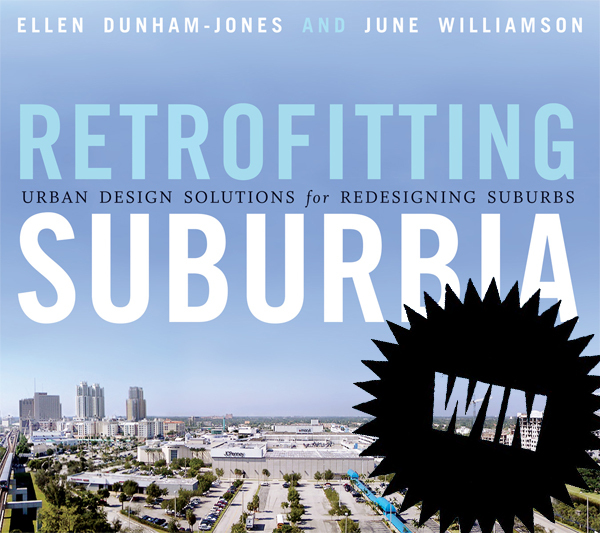 Want to win a copy of the internationally acclaimed book Retrofitting Suburbia, co-authored by Ellen Dunham-Jones and June Williamson? Our first FunUrbanContest is an easy one: All you have to do is follow @MA_Regenerating on Twitter, like us on Facebook and comment on this post with the name of your favorite urbanism books, events, or any other urbanism-related-goodie that you would fancy winning in the future. You see where this is heading? Yep, we’re figuring out what to give away next! The winner will be chosen at random, but extra points go to those who Retweet us, Share this post or Mention our page through Facebook (using the @ tag)– and of course, to those who demonstrate a genuine passion for urbanism! Deadline: next Friday the 27th of May. –UPDATE!! We’re happy to announce the winner of our first giveaway: Yuri Artibise, congrats! Yuri happens to be a freelance writer of urbanism and was one of the first to avidly participate in this contest. Soon you’ll receive a copy of this great resource, Retrofitting Suburbia, in the post. Thanks for the follows, shares and retweets (next time we hope to get a few comments in, as was indicated in the post, hrmmm), and thanks to everyone else who participated. Next giveaway coming up soon — we hope you join us in sharing our passion for urbanism. Stay tuned! Why Retrofitting Suburbia? It’s what our masters program is all about. Most people diss suburbia, but we believe we can’t afford to. Just as the authors does in their book, our program responds to the urgent need to regenerate suburban contexts–what we like to call intermediate landscapes–in order to build a more efficient and sustainable metropolis. We hope you can join us in spreading the word about this unique new program and enjoy a fun and interesting conversation in the process. More to come…let the fun begin! The Master in Regenerating Intermediate Landscapes is an English-language masters program taught at the Universitat Internacional de Catalunya (UIC) in Barcelona. It addresses critical issues surrounding suburbia such as the regeneration of urban sprawl and informal settlements, and the preservation of cultural landscapes, based on the care for local identity, environment and social equity. The course counts on the collaboration of esteemed professionals in the areas of architecture and urbanism like Emily Talen and Julia Koschinsky of Arizona State University, Michael Hebbert of the University of Manchester, and Antonio Font Arellano of Barcelona’s UPC and Brazilian anthropologist Jacqueline Polvora of the University of Cape Verde. Subscriptions are currently open and classes begin this October. For more info, head over to the homepage and browse through our program! Great idea mates! My favorite book is a classic, Jane Jacobs’s Death and Life, but I have others such as Walkscapes, Emergence, Sidewalks or La Ciudad Paseable. All of them pointed out the key role of street life in cities.